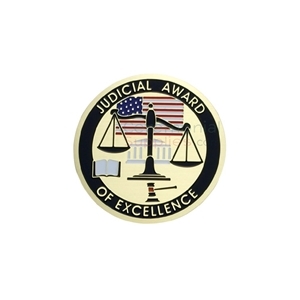 Recognizing the grandeur of our judicial professionals, the Judicial Award of Excellence Medal features these very words circling a balancing scale and an American flag in the background. This is an etched medal measuring 2 inches in size that comes with a 2 .25 inch plain rim medal frame and a 32 X 1.5 neck ribbon in a solid color that you pick. Ribbon colors you can choose from come in blue, red, white, green, gold, black, and purple. 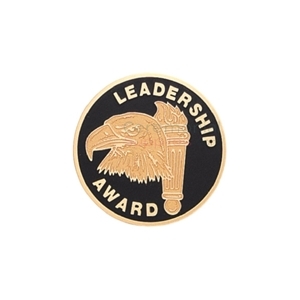 The perfect item to celebrate leadership, this is an etched medal featuring an eagle and a torch, two symbols of superb leadership. The medal measures 2 inches in size and features a 2.25 inch plain rim and a 32 inch by 1.5 inch neck ribbon in a solid color to enable its recipient to hang it around the neck. The ribbon color options include blue, red, white, green, gold, black, and purple. 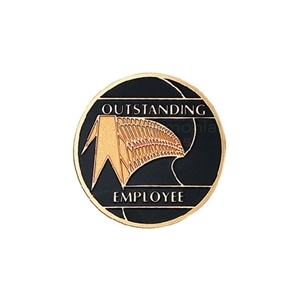 Celebrate the most caring associates in your organization with this is etched medal that measures 2 inches in size with a 2 and a quarter inch plain rim medal frame and an accompanying 32 inch by 1 and a half inch neck ribbon in a solid color. Color options for the ribbon include blue, red, white, green, gold, black, and purple. Employees who go the extra length deserve recognition for it. Here it is! An etched medal that measures 2 inches in size with a 2.25 inch plain rim frame. This desirable token of success can be displayed around the recipient's neck with a 32 X 1.5 inch neck ribbon in a solid color. Color options for the ribbon include blue, red, white, green, gold, black, and purple. Vision. Lead. Motivate. Inspire. Passion. 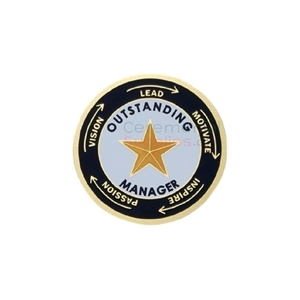 Five words that are marked around an ‘Outstanding Manager’ emblem that serves to recognize the heights reached by a person in charge. This is an etched medal that measures 2 inches in size with a 2.25 inch plain rim medal frame and an accompanying 32 inch by 1.5 inch neck ribbon in a solid color that you choose. Color options you can choose from are blue, red, white, green, gold, black, and purple. 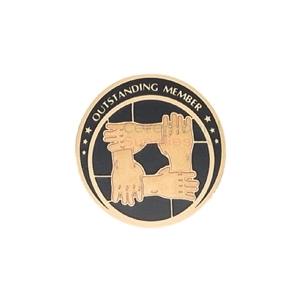 An etched medal to celebrate outstanding performance in sales, this medal measures 2 inches in size, featuring a 2 and a quarter inch plain rim medal frame along with an accompanying 32 X 1.5 inch neck ribbon in a solid color of your choice to display the medal around your neck. The neck ribbon is available in colors such as blue, red, white, green, gold, black, and purple. 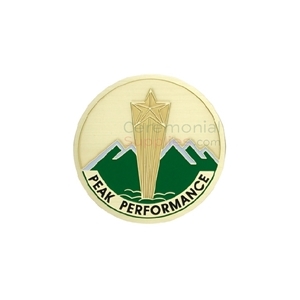 The perfect medal to celebrate individuals who thrive in teams. This etched medal comes in at 2 inches and has a 2 ¼ inch rim medal frame. The Length of the hanging ribbon is 32 inches X 1.5 inch in width. You can choose the color of your ribbon, with your options including blue, red, white, green, gold, black, and purple. An etched medal looking to celebrate the absolute pinnacle of performance, this medal measures 2 inches in size and has a 2 and a quarter inch plain rim medal frame and is accompanied by a 32 inch by 1 and a half inch neck ribbon to hang it around your neck in a solid color that you pick. Ribbon color options available include blue, red, white, green, gold, black, and purple. 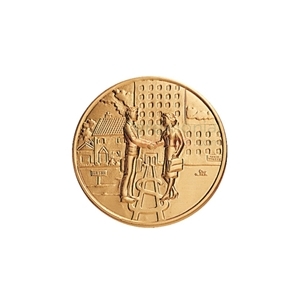 Designed to recognize top producers in real estate sales, this medal features an etched design of a symbolic real estate transaction occurring. The medal measures 2 inches in size and includes a 2.25 inch plain rim medal frame accompanied by a 32 X 1.5 inch ribbon to hang the medal around the neck. The colors you can choose from when it comes to the ribbon are blue, red, white, green, gold, black, and purple. Not every accomplishment in the workplace is an individual achievement or one that turns into instant monetary value. 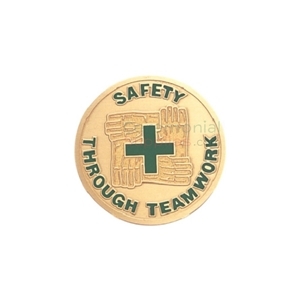 Safety is a big accomplishment that is too often taken for granted. 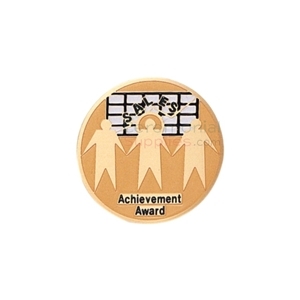 This medal features an etched design and measures 2 X 2.25 inches. 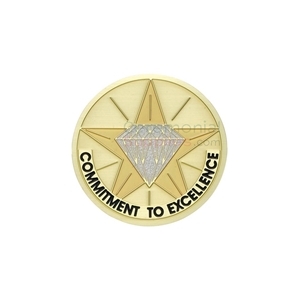 The plain rim medal frame encloses the recognition award while a 32 X 1.5 inch ribbon hangs the medal around the recipients’ necks. The ribbon is available in a wide variety of colors such as blue, red, white, green, gold, black, and purple. Of an almost comedic nature, the etched design of three salesmen side by side with the one at the center [literally] breaking sales records, is a great medal to celebrate excellence in sales. This salesmanship award medal measures 2 inches wide. The rim is 2.25 inches attached to a 32 inch X 1.5 inch neck ribbon in a solid color that you pick out. Color options for the ribbon include blue, red, white, green, gold, black, and purple. Sales is a field so dynamic and challenging, that no amount of awards can ever truly be enough. 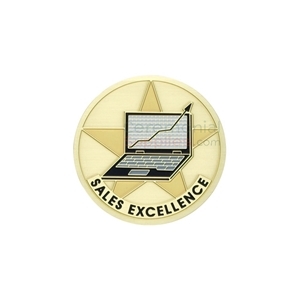 An etched medal to celebrate benchmark setting performance in sales, this medal measures 2 inches in size, featuring a 2.25 inch plain rim medal frame along with an accompanying 32 inch by 1.5 inch neck ribbon in a solid color to display the medal on your person. The neck ribbon can be had in colors such as blue, red, white, green, gold, black, and purple. 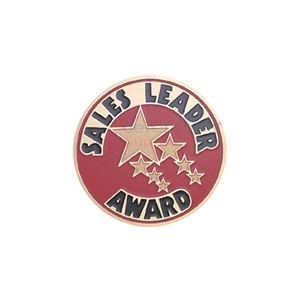 A medal to celebrate leadership in sales, this etched medal measuring 2 inches in size featuring a 2.25 inch plain rim medal frame and a 32 inch by 1.5 inch neck ribbon in a solid color of your choosing. Ribbon colors available are blue, red, white, green, gold, black, and purple. 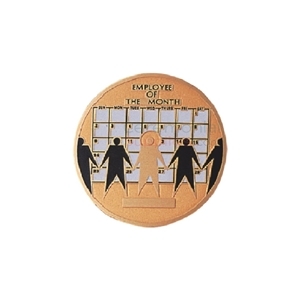 To keep your team motivated, celebrate the salesperson of the month and reward them with this perfect medal. With a 2 inches diameter and a 2.25 rim frame, it hangs proudly from a 32 X 1.5 inch neck ribbon to display the medal around your neck. The ribbon options are blue, red, white, green, gold, black, and purple. Joining the ranks of corporate achievement recognition are ceremonial award medals, providing yet another medium to felicitate exemplary performers in any professional field. Over the years, taking cue from the field of sports and academics, the corporate sector has taken to rewarding individuals whose work excels far beyond that of others with various trophies, certificates and awards. The choice of the reward to be bestowed often depends upon the nature of the work, the scale of the organization and the degree of superlativeness shown in the result. 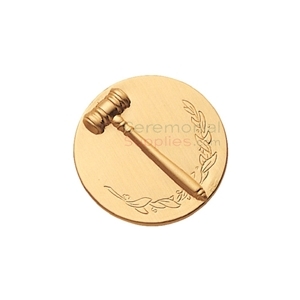 On doing a short examination into the popularity of various mediums, it becomes evident that ceremonial award medals are the most popular way for a company to felicitate its achievers. Ceremonial award medals have found the popularity they have owing to the fact that they straddle the perfect middle ground between award trophies and award certificates, as in they are the perfect reward for when the budget does not permit something as grand as an award trophy, but are still ornate enough to outrank an award certificate. What is an Ideal Corporate Award Medal? 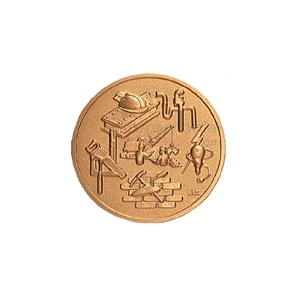 An ideal corporate themed medal is no different from its athletic and academic counterpart when it comes to the core principles. The ceremonial award medal is meant to be worn with pride around the neck just as an Olympic medal. As far as the composition is concerned, ceremonial award medals might be of plastic with a metal-like finish, a pewter cast piece with a metal layering on top, or made out of metal entirely. All ceremonial award medals mimic the representative nature of the various metallic medals as well, with the color gold representing the absolute pinnacle of achievement, silver signifying a close second place, and the color bronze representing a third finish. Just as various medals are created for various sports and sporting events, there is a wide variety of ceremonial award medals for the corporate sector depending on which segment it is intended for. There can be category specific medals, such as for real estate or auto sales, or there can be general medals as well, celebrating overall excellence and proclaiming as such. 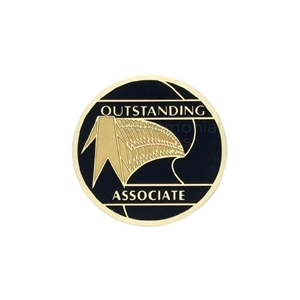 Another example of corporate award medals includes those recognizing achievements in leadership, exemplary performance or salesmanship, all of which can be awarded for a wide range of activities. The world of ceremonial award medals is endless, as it should be. 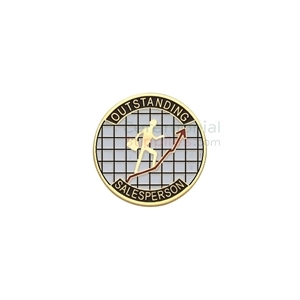 In business, exemplary performances across the board should be celebrated, and being a champion for said cause, CeremonialSupplies.com ensures that every great professional feat is represented in our corporate award medal collection. 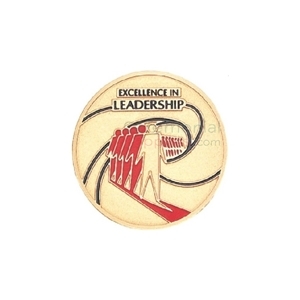 The selection available celebrates the accomplishments by important individuals in the corporate sector, and features both general themes and specific varieties of medals, depending on the magnitude and nature of your event. Peruse through the collection of medals, and choose the one most suited for your awardee(s). 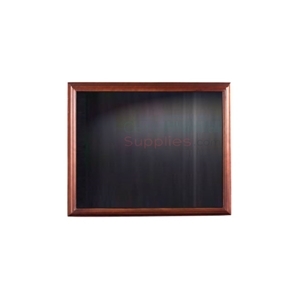 Buy with a few clicks in the most hassle free manner that is a hallmark of CeremonialSupplies.com.